With today's technology surrounding us everywhere we look, it's only natural that logic games will evolve to more modern themes as well. 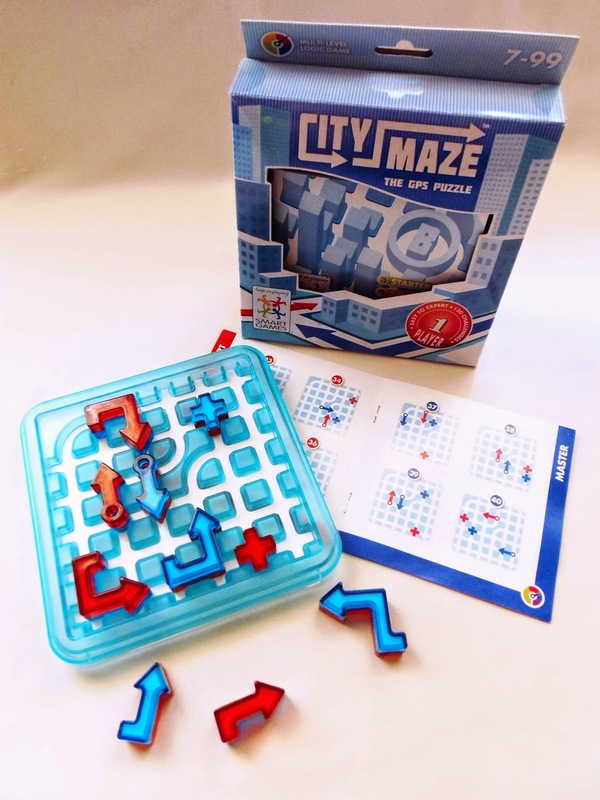 To tackle that need, prolific designer at SmartGames, Raf Peeters, invented a very clever single player puzzle with 120 different challenges to play, the City Maze (The GPS Puzzle), to put your orientation skills to the test. The idea behind City Maze is very simple. The concept is based on the principles of GPS directions used on modern devices - One destination and a starting point. What you see is a grid with an overhead map of a city with streets and highways. To guide you around, colorful arrows, red and blue, placed strategically around the grid, will make sure you will get safely to your destination without getting lost. 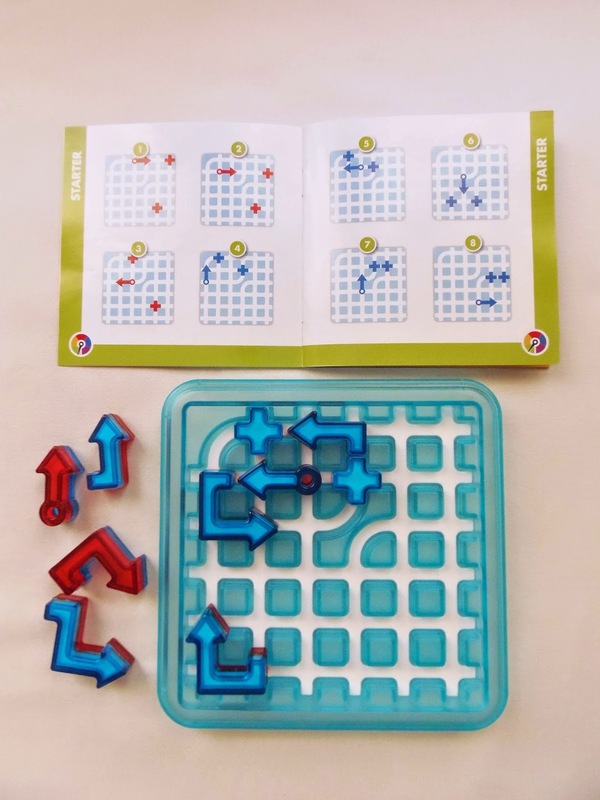 The game consists of 10 double-sided pieces, made from slightly transparent plastic, which creates a stunning visual effect: two crosses (used to signal the destination), two straight arrows (used to signal the start of your journey), and six arrows of varying shapes to help you navigate around the grid. 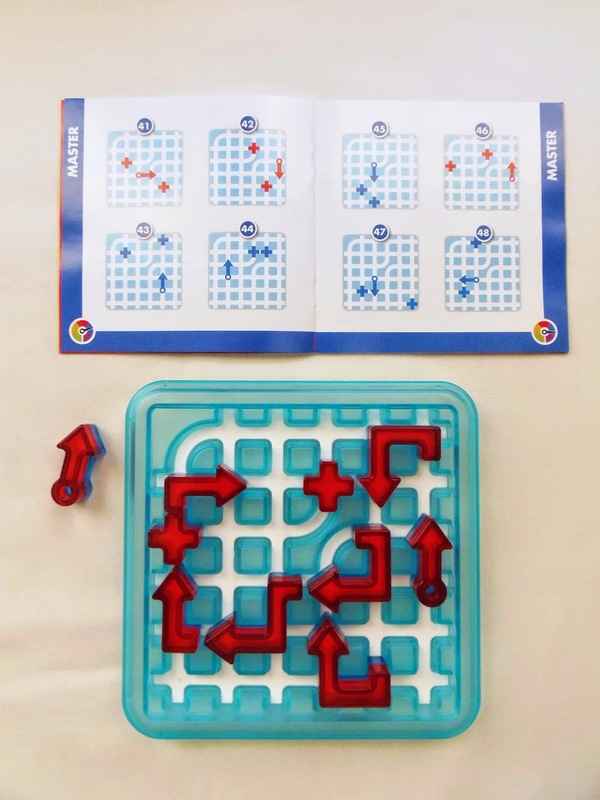 You will be using either the blue or the red sides of the pieces in some challenges, or both. Not all pieces will be needed for all challenges, though. Some will only need a couple of pieces, others will make use of all of them. The game board also comes with a lid so the pieces don't get easily lost, which also makes for a great travel companion. You start by choosing one of the challenges provided, and here is where things get interesting right away. You are provided with not one set of challenges, but actually two, each one with 60 challenges. These two sets are called A and B, and they're only different in the colors they use. 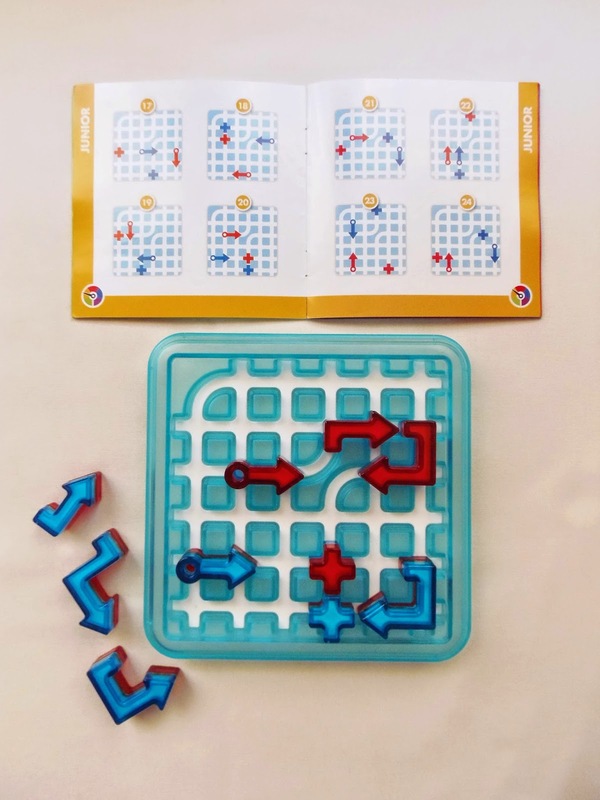 The A set, for example, consists of challenges that use the two colors at the same time, whereas the B set only makes use of one color at a time - You can either have a challenge with only the blue side of the pieces or the red side. Neither set is more difficult than the other, in my opinion, just different approaches. You could argue that deciding which side of any particular piece to use would be a tad more difficult, but I reckon they both start easy enough for you to get the hang of it. You could start with the B set for the simplicity of it, but it's not a requirement. I personally liked the A set more for its diversity and fun factor. Understanding the dynamic of the City Maze can be a bit overwhelming at first, but that's why the first few challenges are very basic - to help you better navigate the city in those more demanding challenges. The first piece is where your journey begins (the straight arrow with a circle). If you're playing with two colors it doesn't matter which color starts first. What you need to do next is follow the path in a straight line right until you encounter a piece signaling the changing of direction. By strategically placing the pieces around the game board you create the path to your destination. A path can only be created by pieces of the same color - Two colors mean two paths and two destinations. Like any other puzzle by SmartGames, the challenges provided are divided by five levels of difficulty. It goes without saying, the level 5 (or Wizard) is a hell of a challenge, but that's why these games are so popular. It caters to any skill level from 7 to 99 y/o. City Maze by SmartGames is a great tool to exercise and keep your brain healthy. It has plenty of variety in the form of a whopping 120 challenges, which is a rare sight in multi-level games, and it's challenging enough for even the most experienced puzzler. Definitely among the best by Raf Peeters. Availability: You can get a copy of City Maze or any other SmartGames product at PuzzlesdeIngenio.com. Jean Claude Constantin has a tradition of naming his puzzles with German words, and the 'Beziehungskiste' puzzle is no different. 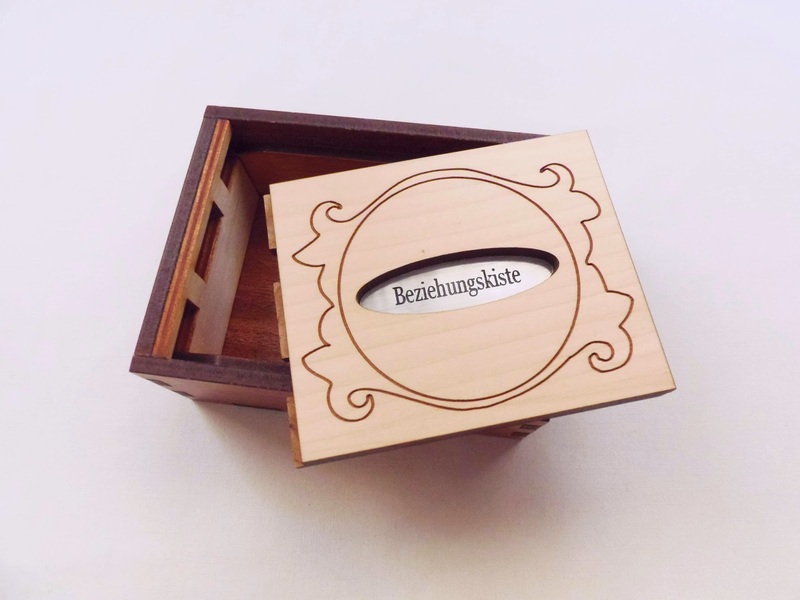 If my German doesn't fool me, 'Beziehungskiste' means 'relationship crate' and, judging by the presentation, it can be used as a perfect gift for your better half. Even better, you can hide a nicer surprise inside and ask that special someone to try and open it. Note: I've come to the understanding that there's a second meaning to the word Beziehungskiste, which is when a couple is hitting a rough patch, or a tricky moment, in their relationship - Thanks Goetz, for the help! The puzzle is a simple Trick Box, which basically means there's usually one or two not-so-straightforward moves necessary to open it. In this case, you'll only need one move to unlock the box, but the mechanism is a bit tricky to figure out at first. The design is stunning and uses two wooden colors for an enhanced effect. There's an engraved floral pattern that makes it look like a jewelry box and in the center, an aluminum plate with the name of the puzzle. The box measures 11cm x 8.5cm x 4.4cm (4.3" x 3.3" x 1.8"), so there's enough room to put some jewelry or other similar small things inside. The mechanism, unfortunately for me, is not new. One of the Trick Boxes in my collection, albeit with a different design, uses the same exact trick to lock the box. Because I already know how some Trick Boxes are opened, I tend to try those tricks first, and got lucky with the first couple of moves. In the end, whether you spend minutes or hours with this box, your a-ha moment will always be guaranteed. It's a great feeling when you finally discover how the mechanism works and using it as a gift box for something special can be even more satisfying. Highly recommended for curious minds. 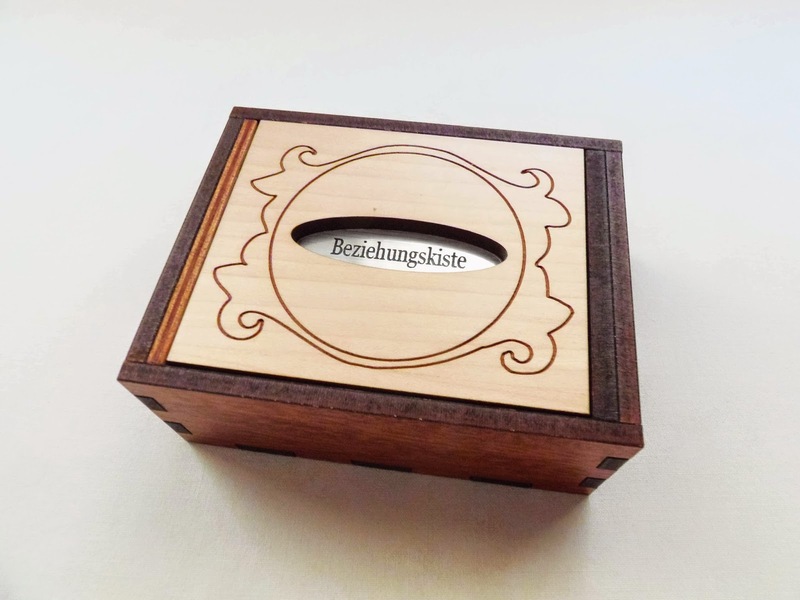 Availability: You can get your Beziehungskiste box at Brilliant Puzzles for $28.95 USD. 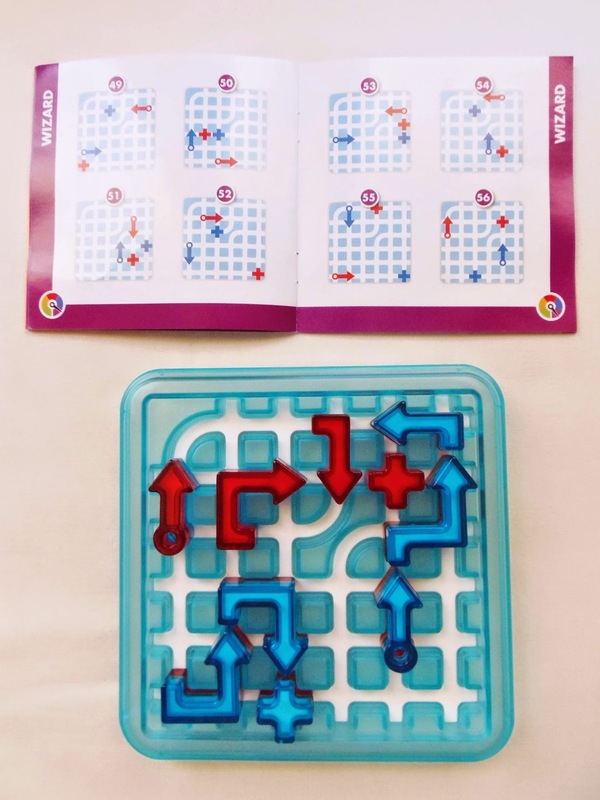 Also, you can check out other interesting puzzles by Constantin.